3003-H14 Aluminum Sheet with excellent weldability and formability, along with strong corrosion resistance, is a popular choice for these qualities and its affordability. It has a smooth, semi-shiny finish. It is available in stock sizes and custom sizes and shapes. 6061- T6 Aluminum Sheet is the most widely used aluminum grade due to its corrosion resistance, strength and machinability. It is limited on formability. It is used for auto and motorcycle parts, structural framing and more. It is available in stock sizes and custom sizes and shapes. 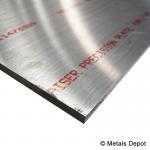 Shop for Aluminum Sheet - 3003, 5052, 6061 Online! 6061-T651 Aluminum Sheet & Plate is the most widely used aluminum grade due to its qualities of excellent corrosion resistance, increased strength, and machinability. Heat treatability, crack resistance, easy weldability and machinability contribute to its use for structural framing, motorcycle and automobile parts and more. It is available in stock sizes and custom cuts and shapes. 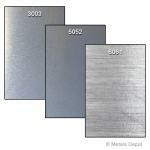 Shop for 6061 Aluminum Sheet & Plate Online! Brass Sheet and Plate is the most popular and affordable of the brass alloys. It offers good corrosion resistance to marine, chemical and industrial atmosphere corrodents. It is easy to cut, weld, form and machine. It is available in both stock and custom sizes. Shop for 260 Brass Sheet & Plate Online! Shop for Copper Sheet & Plate Online! 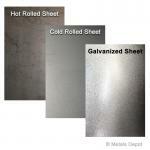 Shop for Galvanized Sheet & Plate Online! 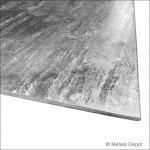 Shop for Stainless Steel Sheet - 304 Online! Shop for 316 Stainless Steel Sheet Online! Shop for Polished Stainless Sheet Online! C1008/1010 CRS Steel Sheets (Cold Rolled) have a fine, smooth surface, ideal for painting. Easy to weld, form, and drill, these sheets are used for a variety of purposes. CRS Steel Sheets are available in both stock and custom sizes. G90 Galvanized Steel Sheet are used when greater corrosion resistance is needed without painting. Easy to weld, form, and drill, the galvanized protection of these sheets has an average life of 20 years. These sheets are used in indoor and outdoor applications. Galvanized Steel Sheet is available in both stock and custom sizes. Shop for Steel Sheet Online!